The final output addresses the needs and desires of the future of design education in a world both converging and expanding” said Omar Vulpinari, Icograda President Elect and Co-chair of the Manifesto update. Associate Professor Maria Rogal’s invited essay “Positioning Communication Design” begins on page 116 of the manifesto, downloadable from the website. 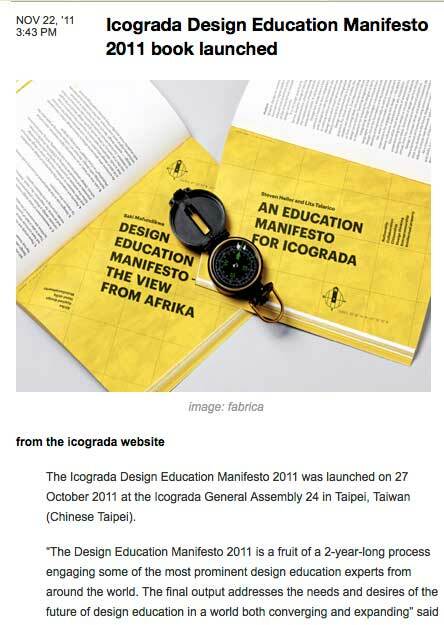 “Co-chairing the Icograda Design Education Manifesto 2011 with Omar Vulpinari has been one of the most meaningful experiences of my professional career. I applaud Icograda for creating the Manifesto back in 2000 and keeping it current because it both mentors and nurtures young and old designers now and in the future,” added Audrey G. Bennett, who worked with Vulpinari throughout the two year process.